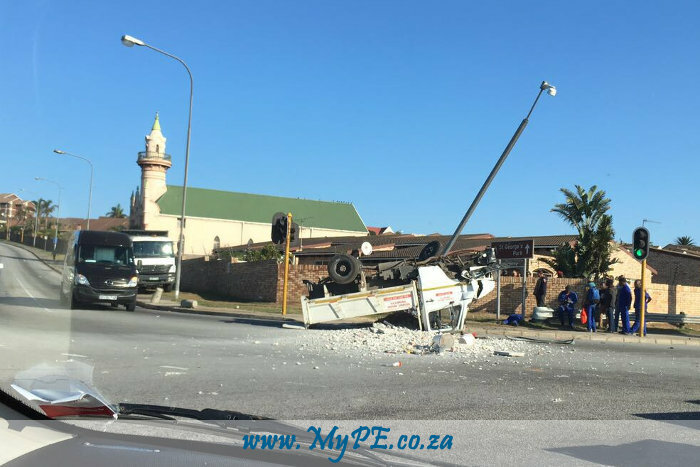 It seems as though our traffic department had their hands full this morning – a tragic accident between a taxi and passenger vehicle in Salsoneville (See: Not what you want to see on a Monday morning) and then later this morning this truck overturned at the bottom of the M9, corner of Settlers Freeway, South End. Those turning lane guides need a bit of work – coming up from the harbour and wanting to turn right onto the Settlers Freeway is equally as hazardous as for those coming down the M9 and wanting to make a sharp turn left or turn onto the Settlers Freeway. Image below courtesy of Gareth who received it from Tim.